International Lawyers submit evidence to ICC Prosecutor over serious crimes in Bangladesh – requests investigation into Government of Sheikh Hasina for crimes against humanity. Application follows evidence of widespread extra-judicial killings during disputed elections in January. LONDON AND THE HAGUE, 4th February 2014 – Today an application was made to the International Criminal Court in The Hague for an immediate investigation into the Bangladeshi Government for crimes committed against its civilian population prior, during and after the recent disputed elections of 5 January 2014. The application was filed by lawyers from the London based chambers of 9 Bedford Row International, on behalf of the International Coalition for Freedom and Rights, an independent human rights organisation based in Europe, whose core membership includes highly regarded international war crimes experts. The application is a prima facie investigation mapped out for the Prosecutor, supported by extensive legal argument that adheres to the requirements of the ICC. The legal team is offering the ICC assistance in identifying those most culpable for crimes against humanity, along with a detailed hierarchy of the Government of Bangladesh, Bangladesh Security Forces and Bangladesh Armed Forces. 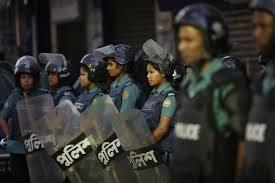 The application outlines extra-judicial murders committed by different arms of the Bangladeshi Government since first coming into power in 2009. The application follows a turbulent period of political upheaval in Bangladesh. The coalition of opposition political parties boycotted the January poll after the refusal of the current government to install a neutral caretaker administration to oversee the vote. The main Islamist Party, Jamaat-e-Islami, was barred from contesting the election and its entire leadership is in arbitrary detention. Opposition leaders have also faced execution for crimes allegedly committed during the country’s 1971 war. Independent legal experts have said the International Crimes Tribunal, created in 2010 by the government of Prime Minister Sheikh Hasina, falls well below the minimum universally accepted standards. It is also alleged that hundreds of opposition activists remain illegally detained or have disappeared in recent months. Evidence is now emerging of widespread and arbitrary arrests of opposition activists, as well as continued extra-judicial killings, torture in police custody and enforced disappearances. Particularly concerning is the deaths of opposition activists in ‘crossfire’ – an explanation used by government forces for unintended deaths during raids on perceived ‘terrorist’ organisations. The communication to the ICC Prosecutor has gained unprecedented support form some of the world’s leading war crimes and human rights lawyers.